And I mean broken to the point I’m ignoring them. Now let me step back and explain. So why are they broken? Take this morning, for example. I’ve only been up for a couple of hours and have already received 11 of them! eleven! Which got me to look back at my notifications data. Facebook only keeps a week back of those – but from what I can tell this week seems pretty representative of what I think is going on. The past week I’ve received a total of 143 notifications, meaning an average of 20 notifications a day! The problem isn’t only in the quantity, though, it’s the quality that counts. I took a closer look into my notifications and realized about half of them don’t really interest me. 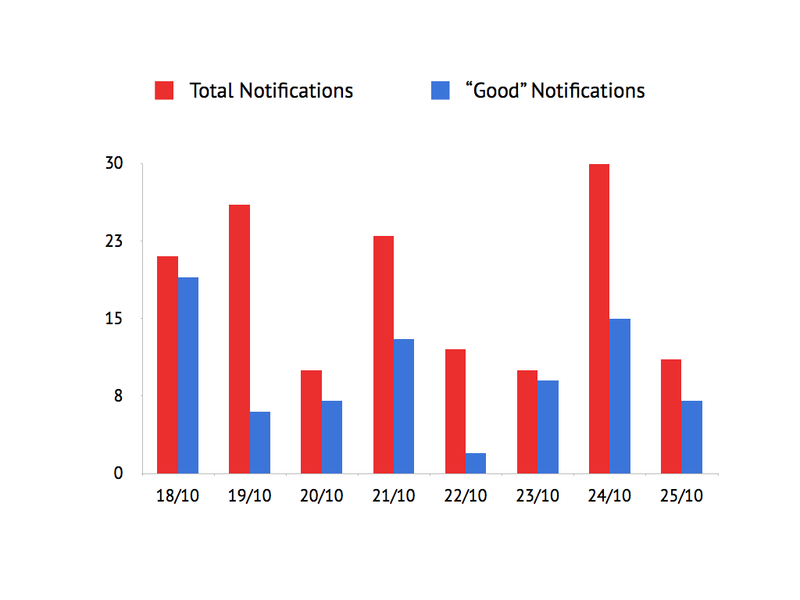 In fact, only 78 notifications across a week were of real interest, meaning 11 a day. Now that’s more like it. groups I’m subscribed to but don’t take an active part in (those groups can change depending on when / where I’m at. E.g. right now I’m in NY so all the groups that have to do with stuff that are going on back in my hometown of Tel Aviv are a waste of time). Getting so many notifications that are irrelevant to me, at least not in an immediate way that requires real-time notifications, is a real problem. It requires a whole lot of time and attention be dedicated to sort through which ones are actually important. And more often than not, I miss the improtant ones. It actually got to the point that I simply pay less attention to notifications as I get them. When I’m busy, I ignore them completely. And that’s sad, since some of them really are important to me. When someone comments on my post or replies to my comment – I do want to know that. Facebook could easily restore my belief in notifications by adding settings to choose which ones I want to get. They already have that for email notifications, but why stop there? And.. taking it a step further they can algorithmically figure out which notifications I’m interested in by learning which ones I actually click on. A rule of thumb that’s pretty apparent is that activity by my friends, on my posts, or that directly follows my posts generally interests me more than activities by strangers. As a start I’d be happy to simply get the option to choose myself though. In the social media era we live in, we’re swamped with enough real-time distractions. I expect nothing less from facebook than to help us deal with it by sorting through the clutter. Next time you get a notification from your first grade classmate inviting you to his garage sale in Alaska, you’ll feel it too.